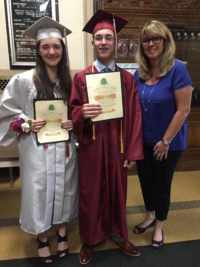 Over the past three years, the Bay Ridge St. Patrick’s Parade Committee has awarded $30,000 to students in the five Bay Ridge Catholic schools and academies who are continuing their education in a Catholic high school. Bay Ridge St. Patrick’s Day Parade Vice President Denise Frederick presents grants to Holy Angels Academy’s Meaghan Delle Cave and Daniel Mundy. Starr Ford – Bishop Kearney H.S. Stephen Caliendo – Xavier H.S. Dylan McMahon – Xaverian H.S.